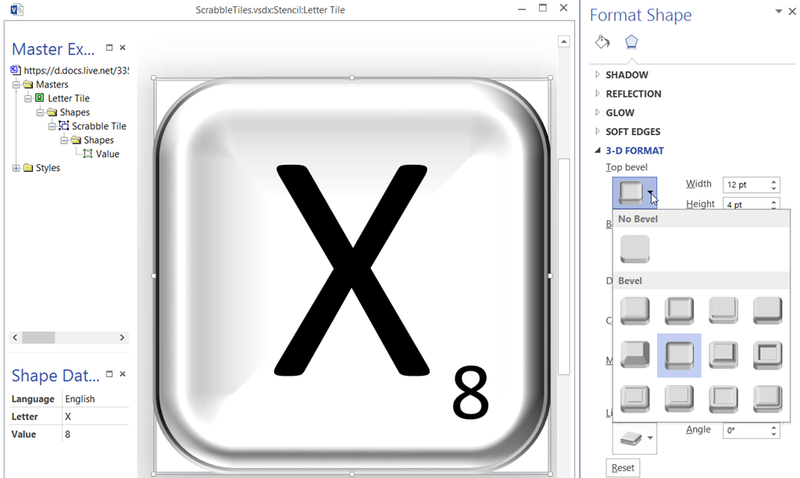 Last day of 2014, and the last of my word and number games in Visio … this is Scrabbled, which is a trainer for Scrabble. Okay, it was too difficult to do a fully working Scrabble board without code, and I was likely to break copyright if I did, so I invented a game with the Scrabble tile rack. I have some suggested rules, but you can make your own up … I just wanted to see what I could do with just ShapeSheet functions..
As John Goldsmith ( see http://visualsignals.typepad.co.uk/vislog/ ) pointed out to me, I don’t need DEPENDSON(User.RandomValue)+ in the above formula because User.RandomValue is already referenced. The Letter Tile is minimalist and efficient as it it is comprised of only one sub-shape (to display the Value), and formatted with the Visio 2013 Top Bevel 3-D Format to give it that cool shaded look. I have built the shape with the ability to include other languages, but have only included English currently.